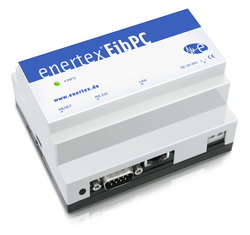 The Enertex® EinPC is a logic machine and visualization server for the KNX bus. 65,000 configurable functions allow complex control logics. Integrated real-time webserver, encrypted remote access, VPN server, visualization of device status and bus telegrams, TCP/IP and UDP communication, e-mail, etc. Implement typical tasks: heating and cooling, shading, etc.